I just added a rare C.S. Lewis book to my library for a very reasonable price, and you can too. But you might want to hurry, since this volume will probably never be reprinted. The small book is entitled Beyond the Bright Blur. It’s contents will be familiar to you if you have read Lewis’ final book, Letters to Malcolm: Chiefly on Prayer. That is because the former is a prepublication printing of chapters fifteen through seventeen from Letters to Malcolm. It was published under unique circumstances, and it is thought that only 350 copies were printed in 1963 by Harcourt, Brace & World. The title of Beyond the Bright Blur is taken from what would appear as letter fifteen in the complete volume. The “bright blur” to which Lewis refers is our imperfect, abstract and remote impression of “God.” He argues that to engage in genuine conversation with our Creator, we must dispel this fabrication. But I can’t leave it at that, because I know—and it’s useless to pretend I don’t know—that they are both phantasmal. The real I has created them both—or, rather, built them up in the vaguest way from all sorts of psychological odds and ends. Very often, paradoxically, the first step [in genuine prayer] is to banish the “bright blur”—or, in statelier language, to break the idol. Lewis’ candid sharing about his personal pilgrimage in prayer is just part of the treasure that is Letters to Malcolm. It is must reading. But, its priceless message is not the subject of this post. I know that most readers of Mere Inkling share my affection for literature . . . along with my own affection for literature incarnated in its own natural state, physical books. The wonderful thing is that adding this particular treasure to your personal collection is within your reach. While the price varies due to the respective booksellers and the condition of each copy, AbeBooks.com often include copies for less than forty dollars. Occasionally an inscribed volume appears on the market, with a corresponding surcharge in the price. As I write this, the copy presented to the poet John Ciardi (1916-86) is available for purchase. While he’s most famous for his translation of The Divine Comedy, he also co-authored a collection of limericks with Isaac Asimov! The posting says the volume includes his signature on the front end paper and “a paragraph [underlined] in the text in red ink.” Still, a truly unique volume such as this is quite a bargain at less than two hundred dollars—especially if you are a fan of Ciardi. I suspect Ciardi received his copy as a gift from the publisher. I haven’t found any evidence that he and C.S. Lewis were acquainted. I did, however, uncover one utterly trivial connection between the two. It appears the two shared an illustrator for some of their American editions. Roger Hane, the cover illustrator for the 1970 Collier-Macmillan edition of the Chronicles of Narnia, also illustrated Ciardi’s undated The Morality of Poetry. It’s curious to consider the varieties of deities worshipped throughout history and around the globe. And it is important that we understand the god we choose to follow, as well as the nature of “faith” allows us. This picture came from a nearby garden. The squirrel effects the pose of a worshipper, but it’s motivated by the nuts the gardener has rested in the Buddha’s lap. It’s not intended to be irreverent, and one assumes that Siddhārtha Gautama would not be offended. The image is provocative. If you were to put yourself in the squirrel’s place, it would be of no surprise that you would be devoted to the “Provider of Nuts,” especially if you did not make the connection between the gentleman who filled and the statue that actually offers them to you. Whether we are adherents of one of the so-called monotheistic religions, or pantheists who see the presence of god in all of universal nature, our “religion” directly affects our worldview and life choices. And then there are the “no religious preferences,” who embrace or reject labels like “agnostic.” Some of them long to believe, but demand proof, where God calls for faith. Others opt for lives of hedonism, gambling that their notion there is no Creator is right. Many of these individuals actively hope that there is no God, and not a few of them have a nagging fear that he may just exist, and call them to account one day for their selfish lives. C.S. Lewis was in the latter category. Before he became a Christian, Lewis entertained no desire to seek Christ out. “Amiable agnostics,” he wrote, “will talk cheerfully about ‘man’s search for God.’ To me, as I then was, they might as well have talked about the mouse’s search for the cat” (Surprised by Joy). God chooses to call us into a restored relationship with himself through the mechanism of faith. If that word troubles you, think of it as “trust.” Faith is necessary, for an obvious reason. In the New Testament, we read, “without faith it is impossible to please him, for whoever would draw near to God must believe that he exists and that he rewards those who seek him” (Hebrews 11:6). That faith is necessary may sound intimidating. However, the good news is that what God demands, he himself provides . . . even to the most reluctant of converts such as Saul of Tarsus or C.S. Lewis of Oxford. In Mere Christianity, C.S. Lewis discusses the nature of faith at great length. He provides a number of helpful images. In the book he clearly distinguishes between faith (trust) and feelings or moods. I enjoy the way that the final sentence of this passage is evocative of the worshipping squirrel which inspired these reflections. Faith, in the sense in which I am here using the word, is the art of holding on to things your reason has once accepted, in spite of your changing moods. For moods will change, whatever view your reason takes. I know that by experience. Now that I am a Christian I do have moods in which the whole thing looks very improbable: but when I was an atheist I had moods in which Christianity looked terribly probable. This rebellion of your moods against your real self is going to come anyway. That is why Faith is such a necessary virtue: unless you teach your moods “where they get off,” you can never be either a sound Christian or even a sound atheist, but just a creature dithering to and fro, with its beliefs really dependent on the weather and the state of its digestion. Dithering to and fro, indeed. I had been thinking about writing on this subject ever since I saw the photo, some months ago. I was spurred to compose it now, by a fact that recently appeared in Ripley’s Believe It or Not. It speaks for itself. A Brazilian grandmother believed she was praying to a figurine of Saint Anthony for years, only to discover that it was an action figure of the Elf Lord Elrond from the “Lord of the Rings” films! I had an entrepreneurial epiphany on how to get rich during the 500th anniversary of the Reformation, and since I’m not an entrepreneur, I’m passing the idea on gratis, to readers of Mere Inkling. Inspired by the shocking success of the Playmobil Martin Luther—their fastest-selling item ever—I wondered what other commemorative items might result in a windfall for investors. The insight struck like the lightning bolt that dropped Luther to his knees and sent him off to the monastery. Since this celebration hearkens back to the beginning of the Reformation . . . back to the day when the 95 Theses were nailed to the door of the Castle Church in Wittenberg . . . it dawned on me that we so indebted to what happened that moment that we are, in a true sense, living on Wittenberg time. What better item to remind us of the significance of this than to turn to expert horologists* and design a Wittenberg Watch? Ideally it would be permanently linked to Wittenberg time. The wearer would also benefit from learning more about time zones and mathematics, trying to sort out the local time, especially when traveling. More about the details in a moment. The nature and passage of time was of great importance to C.S. Lewis. He devoted an entire chapter to the subject in Mere Christianity. In “Time and Beyond Time,” he explores how God acts within history, but is not subject to time’s constraints. If you picture Time as a straight line along which we have to travel, then you must picture God as the whole page on which the line is drawn. We come to the parts of the line one by one: we have to leave A behind before we get to B, and cannot reach C until we leave B behind. God, from above or outside or all round, contains the whole line, and sees it all. Another difficulty we get if we believe God to be in time is this. Everyone who believes in God at all believes that He knows what you and I are going to do tomorrow. But if He knows I am going to do so-and-so, how can I be free to do otherwise? Well, here once again, the difficulty comes from thinking that God is progressing along the Time-line like us: the only difference being that He can see ahead and we cannot. Well, if that were true, if God foresaw our acts, it would be very hard to understand how we could be free not to do them. But suppose God is outside and above the Time-line. In that case, what we call “tomorrow” is visible to Him in just the same way as what we call “today.” All the days are “Now” for Him. He does not remember you doing things yesterday; He simply sees you doing them, because, though you have lost yesterday, He has not. He does not “foresee” you doing things tomorrow; He simply sees you doing them: because, though tomorrow is not yet there for you, it is for Him. You never supposed that your actions at this moment were any less free because God knows what you are doing. Well, He knows your tomorrow’s actions in just the same way—because He is already in tomorrow and can simply watch you. In a sense, He does not know your action till you have done it: but then the moment at which you have done it is already “Now” for Him. Since God was/is witness to that day in Wittenberg, just as he knows our tomorrows today, we see his placing of creation within the linear progression of history is intentional. It does not restrict our Lord in any way, but it enables us to comprehend our existence. And thus, we are compelled to mark the passage of time. What Might the Wittenberg Watch be Like? Something elegant and tasteful, yet modest and unobtrusive. A watch like the one pictured above. It’s produced by Swisstime and has the added benefit that it is part of their “Rebellion” line, which means that Roman Catholics shouldn’t be excluded from the market. The only minor drawback is the price, $930,000. It seems to me that a wise businessperson could undercut that by thirty or forty thousand, and only need to sell two or three watches to retire in comfort. An astute investor will recognize that the Wittenberg Watch concept easily translates for an ecumenical audience. One easily imagines other editions for various denominations. Anyone who desires can feel free to run with this idea. I relinquish all rights to the concept of religious timepieces. As for now, I’ve been rethinking the idea altogether. I’ve decided it’s best for me to reset my own watch to Jerusalem time. ** It’s quite possible that televangelists already own the Rebellion Reb 5 Diamond timepiece pictured above, however, the members of their digital congregations may be in the market for something more modest. They most certainly do, if you are discussing the influence of parents on their children’s religious practices. And, as politically uncomfortable as it may make people, the example of the father appears to exert far more influence than that of the mother. In 2000, a Swiss study was released that revealed, in part, the way parental faith is transmitted to children. I was reminded of it while reading “Dads Being Dads,” in the current issue of The Lutheran Witness. A Touchstone article (linked below) analyzed the study. It compared the frequency of worship attendance by parents with the consequential involvement of their children as they matured. If both father and mother attend regularly, 33 percent of their children will end up as regular churchgoers, and 41 percent will end up attending irregularly. Only a quarter of their children will end up not practicing at all. If the father is irregular and mother regular, only 3 percent of the children will subsequently become regulars themselves, while a further 59 percent will become irregulars. Thirty-eight percent will be lost. Of the three kids, I am a regular church attender. Not just because I’m a pastor; since I’m “retired” and have no external obligation to attend. My sister attends occasionally. My brother only for special, family events. Hmmm, that is merely anecdotal, of course, but my observation of other family histories seems to bear out the findings of the demographic study. While some readers may wish to challenge the applicability of a Swiss study to other nations, the simple fact that the burden to do so rests on them. The experience in Switzerland is almost certainly common to the rest of Europe and the other increasingly secularized countries of the West. And, since it is about gender distinctions rather than culture variations per se, it may even correlate to less industrialized contexts. Just how much more significant is a father’s example than a mother’s? Even when the father is an irregular attender there are some extraordinary effects. An irregular father and a non-practicing mother will yield 25 percent of their children as regular attenders in their future life and a further 23 percent as irregulars. This is twelve times the yield where the roles are reversed. Let’s consider that statistic a fluke, and cut it in half . . . no, into quarters. Even if is off by that great a magnitude, it would still mean that in this scenario, a father’s example is three times as significant as mother’s. The study does not concern itself with the reasons for the disparity, but I have a theory. At the risk of sounding like a traditional dinosaur, as C.S. Lewis described himself, allow me to offer it. Women are inherently more receptive to Christian virtues such as compassion, gentleness, and mercy. Even if their mother discounts worship, the hearts of most girls are still attuned to its song. Christian virtues of forgiveness and meekness resonate less in boys (not just because of their upbringings). If a father goes to church without his wife, daughters will still be inclined to desire to accompany him. This doesn’t mean, of course, that single mothers should despair. God is the One who draws us to himself, and he can most definitely do so in the absence of any other positive influences. This is my prayer of gratitude: God bless faithful mothers. If a live dinosaur dragged its slow length into the laboratory, would we not all look back as we fled? What a chance to know at last how it really moved and looked and smelled and what noises it made! And if the Neanderthaler could talk, then, though his lecturing technique might leave much to be desired, should we not almost certainly learn from him some things about him which the best modern anthropologist could never have told us? He would tell us without knowing he was telling. One thing I know: I would give a great deal to hear any ancient Athenian, even a stupid one, talking about Greek tragedy. He would know in his bones so much that we seek in vain. At any moment some chance phrase might, unknown to him, show us where modern scholarship had been on the wrong track for years. Ladies and gentlemen, I stand before you somewhat as that Athenian might stand. I read as a native texts you must read as foreigners. You see why I said that the claim was not really arrogant; who can be proud of speaking fluently his mother tongue or knowing his way about his father’s house. . .
Where I fail as a critic, I may yet be useful as a specimen. I would even dare to go further. Speaking not only for myself but for all other Old Western men whom you may meet, I would say, use your specimens while you can. There are not going to be many more dinosaurs. You can read the cited article from Touchstone magazine here. Are you driven by the unquenchable thirst to be the center of everyone’s attention. Or, would you be more content to live out your life appreciated by a small cadre of friends? A woman in South America recently displayed an extreme case of the former impulse. She had grown tired of her name because it was too mundane. Apparently she garnered insufficient attention as Ladyzunga Cyborg. So now her name, legally changed, is ABCDEFGHIJKLMNOPQRSTUVWXYZ. My first thought when reading this was not that I didn’t believe it. In our foolish world, where people use symbols that aren’t even words for their names, I just shook my head. And . . . I thought “how fortunate for her that she’s not Chinese,” with its 46,964 characters as recorded in the Kangxi Dictionary. This is not the sort of publicity Columbia needs. She’s acting bizarrely enough to be a mistaken for a Californian. Of course, people at the opposite extreme—those who cannot bear the presence of other human beings—are also troubled. As with so many aspects of the human personality, people at either of the extreme poles are frequently deemed mentally ill.
My “introvert” quotient appears to be eclipsing my “extravert” qualities. C.S. Lewis never sought the limelight either. He did not find his experience with notoriety pleasant. And yet, he accepted its burden graciously. It is commonly known that some days he would spends hours (literally) corresponding with some of the thousands of readers who wrote to him as the creator of Narnia. I assume people like Ms. Abcdefghijklmnopqrstuvwxyz seek attention because they feel insignificant or unnoticed. I find that tragic. Tragic because their name, their true name, is known by the most important and amazing person in the universe. The God who created them. Each and every person, including you, is unique, precious and loved. Knowing this provides profound peace. It also delivers us from the constant compulsion to seek attention. And you, that’s you, are far more precious than these. Can you imagine having singer Bob Dylan as your high school history teacher? According to a recent interview,* it could have happened. I didn’t realize he and I had so much in common! When I did my undergrad studies in history, I took every Roman history course the University of Washington offered. As for theology . . . well, having become a pastor, my interest in the study of God’s revelation of himself to the world is a given. In 1979, Dylan released the first of three “Christian” albums, “Slow Train Coming.” It has a number of great pieces, and I listen to the album at least once a month. One song, “Gotta Serve Somebody,” won him the Grammy that year for “Best Male Vocalist.” It’s lyrics are sobering, and everyone should hear it at least once. Well, we weren’t actually. But, here at Mere Inkling we usually do. These two men bear some obvious parallels. They are masters of words. Poets extraordinaire. Lewis and Dylan both possess enviable creative imaginations. Each has accumulated a vast legacy in their work, which will continue to inspire for many generations to come. 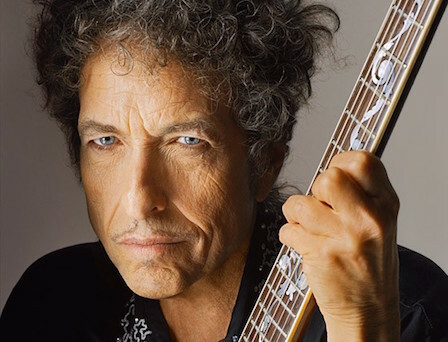 In a moment we will listen to Dylan’s ballad about the choice before us. First, though, consider how Lewis uses the imagery of the war engulfing the world in the 1940s to describe this truth. Why is God landing in this enemy-occupied world in disguise and starting a sort of secret society to undermine the devil? Why is He not landing in force, invading it? Is it that He is not strong enough? Well, Christians think He is going to land in force; we do not know when. But we can guess why He is delaying. He wants to give us the chance of joining His side freely. I do not suppose you and I would have thought much of a Frenchman who waited till the Allies were marching into Germany and then announced he was on our side. God will invade. But I wonder whether people who ask God to interfere openly and directly in our world quite realize what it will be like when He does. When that happens, it is the end of the world. When the author walks on to the stage the play is over. God is going to invade, all right: but what is the good of saying you are on His side then, when you see the whole natural universe melting away like a dream and something else—something it never entered your head to conceive—comes crashing in; something so beautiful to some of us and so terrible to others that none of us will have any choice left? For this time it will be God without disguise; something so overwhelming that it will strike either irresistible love or irresistible horror into every creature. It will be too late then to choose your side. There is no use saying you choose to lie down when it has become impossible to stand up. That will not be the time for choosing; it will be the time when we discover which side we really have chosen, whether we realized it before or not. Now, today, this moment, is our chance to choose the right side. God is holding back to give us that chance. It will not last forever. We must take it or leave it. (Mere Christianity). *You can read the entire interview in the current issue of AARP The Magazine, available here.